Duke Caribbean is the fondest-remembered of the licensed Duke 3D addons. Duke it Out in D.C. had some great maps, but generally lacked the funny. Nuclear Winter was just awful. Caribbean was colorful; had new sprites for all the weapons, collectibles, and monsters; and plain just had interesting and varied level design. 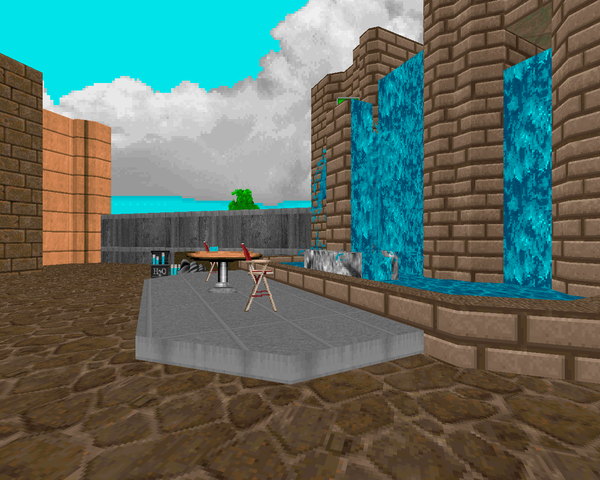 Joseph "DoorHenge" Otey decided to bring the magic to Doom (as DooM Vacation) using the ZDoom engine as his canvas. The story is pretty token; essentially Doomguy lands in the ocean after killing another boss brain, only to end up at an island resort chock full of evil. The first three levels of Duke Caribbean are stunningly recreated here, along with the secret. Many of the pickup sprites return, though they've been used to fit different purposes. The Conchonator, for instance, became the SSG replacement (with an appropriately annoying blow). While the level layouts are exactly the same, Otey's taken some... liberties. The big surprises happen in the first level, where you'll see a few changes to the wandering beach babes (some are sunburned and some are redheads) as well as some anomalous situations in the hotel rooms. The seagulls are back and basically an annoyance. They replace the lost soul, which makes pain elementals uniquely humorous. You'll also notice the bright blue palette reflected in some of the enemies, notably the arachnotron and cacodemon. At times, I get the impression that this conversion was a bit hasty. The secret level is boring to play, for the most part, and the final fight at the water park is ridiculous, considering your supplies vs. the actual threat. And, while I admire its overall fidelity to the originals, I still find myself wishing Otey had taken more artistic liberties. Not like the trashy humor insertions of MAP01, but any new added stuff to the layouts. I also would have liked to see the whole pack remade, but I suppose he had his reason for stopping there. Maybe recreating the latter works in ZDoom was too demanding. If you haven't played Caribbean before, the style of puzzle solving is a little more complicated than Doom's, favoring switch hunts and exploration, with the results of your work often less than obvious. Having played the stuffing out of it before, I can't say I got stuck much anywhere, though some of the fighting is obviously quite different. People that favor traditional Doom maps may get stuck quite easily with the amount of jumping, crawling, and swimming you have to do in order to complete the maps, not to mention the plentiful number of secrets stashed around the place. 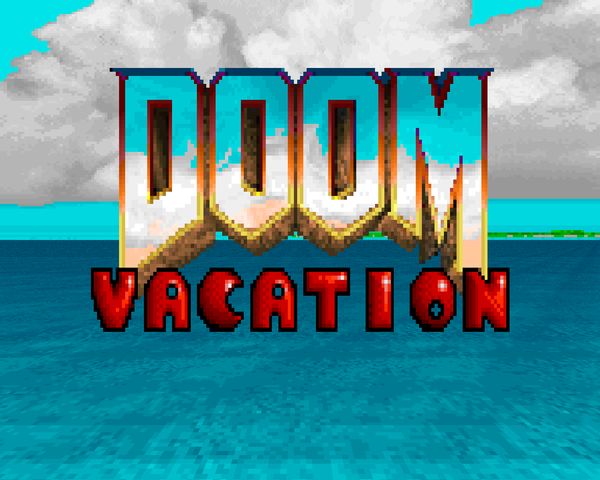 I would recommend DooM Vacation if you remember Caribbean fondly, or just want to play on the lighter side of Doom WADs for a little while. You know, when you're not doing -FAST runs of Deus Vult II to prepare for Huy Pham's second edition. If you hate Duke or confusing level design, or just don't like to have a good laugh or two, steer clear. It's an amusing project; I just feel that so much more could have been done, especially after playing something like Return of the Triad. Just, uh, watch out for those bikini-clad women or you'll find yourself crowd surfing. Approximation of a Caribbean hotel, complete with beachfront, lobby, souvenir shop, hotel rooms, and dance club / karaoke bar. Funnily enough, Otey made this map dirtier than the original, what with several of the babe replacements (and the Scarface room). It plays kind of similar but more and less dangerous in certain spots. The sunburned Cyberdemon is a great laugh but actually killing him is another story. Also, waaay too many girls in the dance club. At least in ZDoom you can get on top of them to get past. The card puzzles are a bit obtuse but the shooting gallery one has actually been dumbed down. 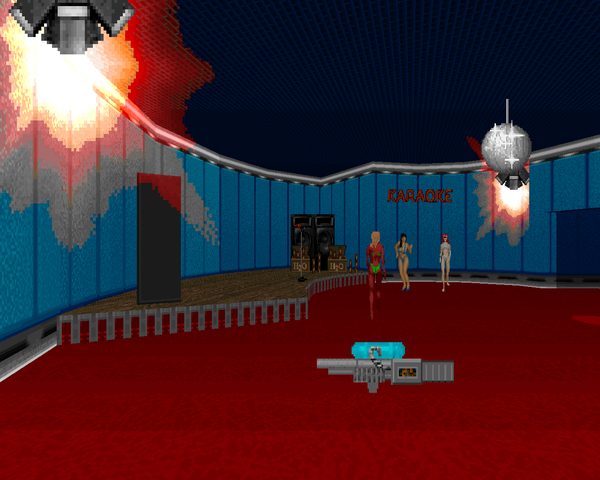 I dunno how Doomguy ended up in jail, but the trickery done to approximate Build effects in this level (like the crashing bus) is pretty good, not to mention the various exploding walls. 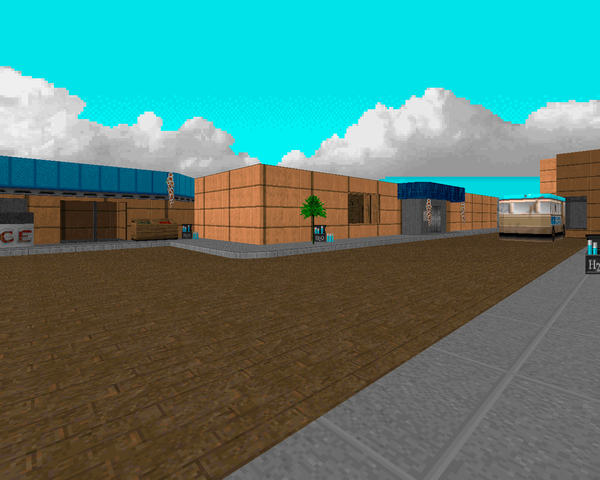 It's a Caribbean marketplace filled with demons including some back rooms and some public areas, most notably a concert pavilion and some docks. I'm also glad to see the secret is still intact. This map is a bit trickier but you start out with the SSG, and shotgun ammo is practically caked around. Just watch where you decide to dip your toes in; those packs of cacodemons are actually pretty intimidating. Given Duke's recent release, this level's title is a bit awkward. It's a casino, of course, crammed full of zombiemen with a few stronger demons representing. The opening is pretty harsh, but you can make a decent recovery. 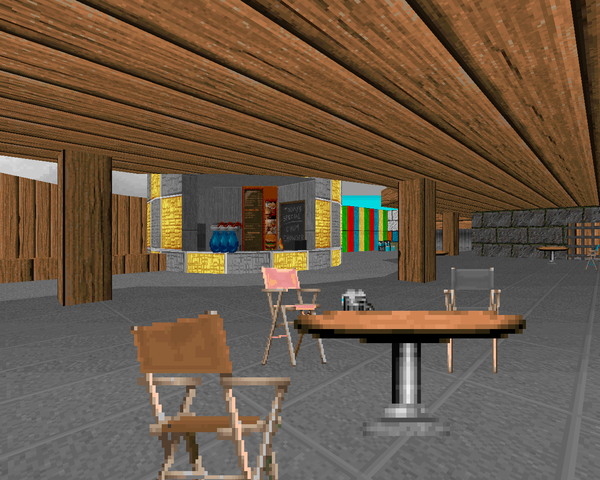 As you progress through the level, more beasties spawn in at the various tables and booths and in the restaurant. Some of them are perfectly willing to wail on the player while others... Well, you'll see. 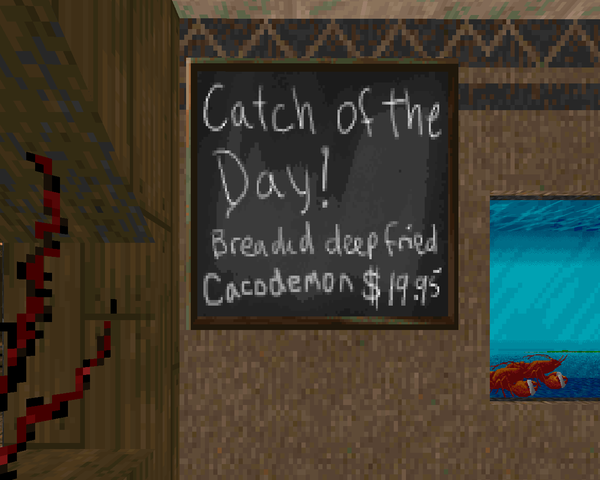 The restaurant is the most inspired section of the map, featuring several fish tanks you have to dive in from the top. It reveals one of ZDoom's limitations as you telefrag the demons in the shallow tanks. Also, you'll find that the pain elemental is mostly harmless. Your final destination is a small waterpark with three different rides. There's a slow, scenic ride for children that has some okay backdrops, a rafting ride designed to get the riders wet, and of course the superfast log flume. Otey has stuffed the lines full of Hellspawn waiting for their turn, and they won't tolerate line jumpers. You'll have to do some exploration to get the keys and get out. It'll also help if you bring stuff over from a previous map. Ammo is pretty tight, here, what with the thick cacodemon packs and no small number of Cyberdemons. The final fight is just ridiculous; I hope you have the good sense to just book it to the water slide. Sure, there's a BFG stashed around, but it hardly helps when you're the shooting gallery. I love both Duke Caribbean and Doom Vacation wad, the author was really smart recreating the Duke expansion. Yes I have played Duke Caribbean as well (I own legit psychical copy of the addon but the addon is very hard to install, I had to use DOSBOX Launcher, a frontend by Skulldog). 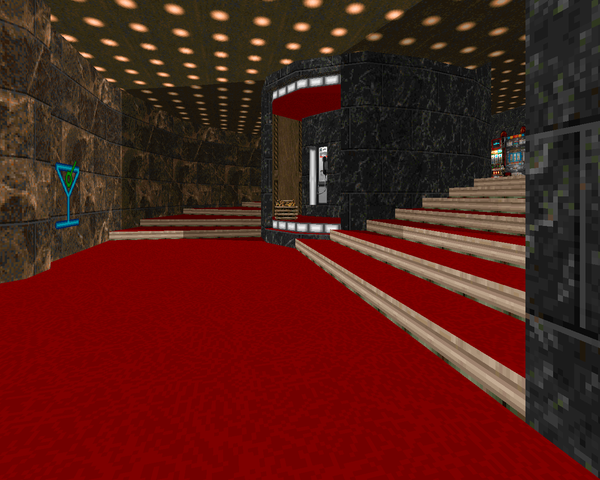 Shame the author of wad didn't recreated all the levels, only 4 maps it seems! It also seems the author only used the sprites as replacements, he should have made new behavior for items, for example the Pearl Health should give +50 health (in DN3D atomic health gives you +50) but he still used Doom's default behavior that gives you +100, basically a soulsphere, when the mod is for ZDoom and allows new items to be created! Also in review it seems both levels "A Full House" and "Mr. Splashy" are MAP03, shouldn't the last one be MAP04? You still didn't fix the error!